Daniel Bodansky is Regents’ Professor at Arizona State University’s Sandra Day O’Connor College of Law. He served as Climate Change Coordinator at the U.S. State Department from 1999-2001). His book, 'The Art and Craft of International Environmental Law', received the 2011 Sprout Award from the International Studies Association as the best book that year in the field of international environmental studies. His new book, 'International Climate Change Law', co-authored with Jutta Brunnée and Lavanya Rajamani, was published by Oxford University Press in June 2017, and received the 2018 Certificate of Merit from the American Society of International Law as the best book in a specialized area of international law published the previous year. He is a graduate of Harvard (A.B. ), Cambridge (M.Phil.) and Yale (J.D.). 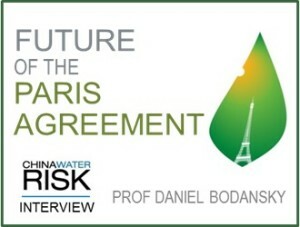 On 14 May 2018, China Water Risk was invited to the conference, ‘The Future of the Paris Agreement’ organised by Civic Exchange and Hong Kong University of Science and Technology’s Institute for The Environment. The speaker of the event was Professor Daniel Bodansky, a co-author of the award-winning book, ‘International Climate Change Law’ and well-known expert in international law and climate change. After the event, we had the opportunity to sit down with the professor to hear more – how far has the Paris Agreement taken us and what’s next? China Water Risk (CWR): As co-author of the award-winning book, “International Climate Change Law”, you clearly know global climate change law. The Paris Agreement, in particular, has been described as a watershed moment. How is it different from what came before (e.g. the Kyoto Protocol)? First, the Paris Agreement lets each country define its own mitigation contribution, in contrast to the Kyoto Protocol, which took a one-size-fits-all approach for Annex I parties (roughly speaking, developed countries), establishing absolute, economy-wide emission targets for each Annex I party, determined through international negotiations rather than by each country individually. Second, parties’ nationally determined contributions (NDCs) under the Paris Agreement are not legally binding. Each party has a legal obligation to communicate and maintain an NDC, but it does not have a legal obligation to achieve its NDC. In contrast, the emission targets for Annex I parties under the Kyoto Protocol were legally binding. Third, the Paris Agreement takes a much more nuanced approach to differentiating the commitments of developed and developing countries than the strict bifurcation in the Kyoto Protocol between Annex I parties, which had legally binding emissions targets, and non-Annex I parties, which did not. In contrast, the Paris Agreement establishes the same basic mitigation commitments for all parties – most importantly, to prepare, communicate, and maintain an NDC; to provide information on its NDC both ex ante (to facilitate transparency, clarity and understanding) and ex post (to allow assessment of implementation and achievement); and to participate in various international review processes. CWR: So the Paris Agreement represents a new paradigm of climate change law. What do you see as the main successes and challenges coming out of Paris? Are the NDCs (Nationally Determined Contributions) ambitious enough? DB: The Paris Conference was able to agree on a truly global legal instrument to address climate change, which has been almost universally accepted by states. This was a huge achievement, given the political differences that had bedeviled the negotiations for so many years. I have described the Paris Agreement elsewhere as a ‘Goldilocks solution’, neither too strong (which might have made it unacceptable to key states) nor too weak (which would have it ineffective). To safeguard national decision-making, it adopts a bottom-up approach. But to promote stronger action, states’ NDCs are complemented by international norms to ensure transparency and understanding and to prod states to progressively ratchet up their efforts. First, the NDCs pledged by states in Paris are insufficient to put the world on a pathway to limiting climate change to well below 2° C above pre-industrial levels, the goal of the Paris Agreement. Whether the Agreement is successful depends on whether states increase their effort over time in order to close the so-called ’emissions gap’. Second, the Paris Agreement is intended to encourage states to ratchet up their contributions through its ‘cycle of contributions’, which provides for a global stocktake of collective progress every 5 years and a new round of NDCs by parties informed by that global stocktake. Third, the Agreement contains a lot of ‘constructive’ ambiguity, which did not definitively resolve issues. So debates continue between developed and developing countries over perennial issues such as differentiation and finance. CWR: The Agreement has been in effect for more than a year now. Going forward, are you wary of any major obstacles to completing the Paris Agreement Work Program? DB: The Paris Agreement work program is scheduled for completion at the upcoming Conference of the Parties (COP) in Katowice, Poland, in December of this year. But much work remains to be done in order to complete the so-called Paris rulebook, so that it can be adopted in Katowice. In addition to differences between states about the rulebook’s substantive content, a number of more general issues remain unresolved, including the degree to which the rules should be legally binding, how detailed they should be, and the degree to which they should be differentiated versus uniform in their application. CWR: Can you elaborate a bit on the Paris ‘rulebook’? What is it and how will it help? DB: The Paris ‘rulebook’ is intended to elaborate many of the Paris Agreement’s provisions. It will include rules, guidelines, modalities and procedures on a variety of issues, including communication of NDCs, accounting, the new market mechanisms, adaptation, finance, the enhanced transparency framework, the global stocktake, and the implementation and compliance procedure. In contrast to the Kyoto Protocol, which, in effect, could not operate without the elaboration of additional rules, the Paris Agreement can be implemented as is. But the elaboration of additional rules will provide clearer guidance to states about what they need to do under the Paris Agreement, reduce potential sources of disagreement, and make implementation of the Paris Agreement more effective. CWR: One widespread concern is the withdrawal of the US from the Agreement. What are your views on this? Can you expand on the potential impacts, both short and long term? DB: The United States has not withdrawn yet from the Paris Agreement and is still a party. What President Trump did in June 2017 was to announce his intent to file a notice of withdrawal under the terms of the Paris Agreement, which could be done beginning in November 2019 and would take effect one year later (i.e., November 2020). In the short term, the Trump announcement has not led other states to weaken their commitment to the Paris Agreement, and has not undermined the current negotiations on the Paris rulebook. But, in the longer term, if President Trump follows through and withdraws the US from the Paris Agreement as of 2020, and that decision is not reversed by the next administration, this is likely to make it more difficult for other states, politically, to ratchet up their commitments, as contemplated by the Paris Agreement. CWR: The COP24 conference will be held in Katowice, Poland this December. Will you be attending? What do you expect and how optimistic are you? DB: Yes, I will be attending the Katowice conference. I would describe myself as cautiously optimistic. As a so-called ‘frequent COP-er’, I know how difficult reaching consensus is and appreciate how many things can go wrong. And the pace of work on the Paris rulebook has certainly not been encouraging. So I think it is possible that states will not be able to reach agreement on the Paris rulebook in Katowice, and additional meetings will be necessary. But I think states continue to be strongly committed to the Paris Agreement and are unwilling to let the negotiations fail. So where there’s a will, there’s usually a way.